So far, everyone is expecting 2017 the year to be about mobile first indexes on Google. With the most recent news, this certainly seems to the case. Google has recently announced penalties for mobile intrusive intersitals, so some webmasters may find they need to invest in a little more website optimisation to ensure their site doesn’t run afoul of the new policy. Not sure where to start? 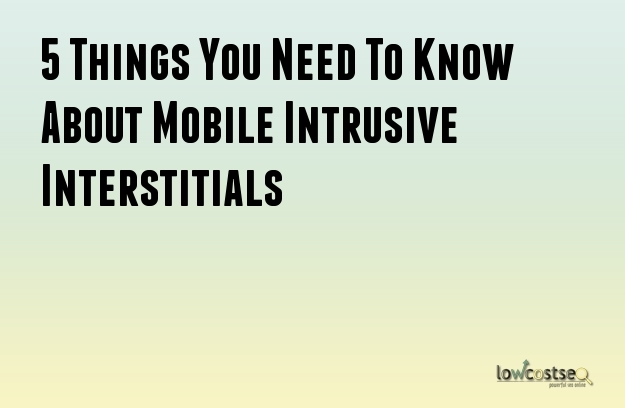 Here are 5 things you need to know about the new changes to interstitials. For the purposes of SEO, interstitials. refer to advertisements that appear while the page is loading. These are designed to appear, consequently when the user first uses the page. They can often be quickly closed or removed, but they nonetheless block some of the content on the page itself. The name comes from the fact that it occupies the interstitial space between Google’s search results page and the desired content, although one could also argue it equally takes up the space between the user and the target content. As stated, Google is only issuing penalties (in the form of lower rankings) for those interstitials. that are deemed intrusive. Pop-ups that “covers the main content, either immediately after the user navigates to a page from the search results, or while they are looking through the page”. Standalone interstitials which “the user has to dismiss before accessing the main content”. As you can see, Google’s main focus is on adverts, pop-ups and other barriers that block the content. This makes sense for Google – if you’re letting it crawl your website but then purposefully blocking this content upon immediate viewing, this can greatly disrupt the viewing experience. Functional/Required Interstitials Are Still Okay. Some interstitials. are still required and, as long as they don’t block all of the content, Google seems to cooperate with them. For example, a cookie notice is common interstitial that is often required. This serves a purpose so, as long as its small enough, Google won’t issue any penalties. Age verification was also given as an example, as it also has a specific purpose. While this most recent update might make it seem like interstitials are completely disallowed, that’s not the case. Small pop-ups are still allowed. As mentioned earlier, Google is concerned about pop-ups that hide the content – so a small interstitial should still let the reader view the start of such content above the fold. At the very least, the header and opening paragraph would be a very safe bet. These guidelines aren’t seeking to actively punish the use of interstitials on mobile pages, but rather to improve the user experience. If someone can’t see the information they want, this can have a negative influence on many areas, from their satisfaction to the bounce rate and, of course, to your overall ranking. In short, keep the content accessible. This same logic also goes for the likes of pay-walls and other barriers that prevent people from easily viewing the content that Google is crawling for its results.